Like many American families the summer time is our chance to pull out the grill and cook up all sorts of tasty meals. We tend to do so once a week, usually on Sunday. The best part in my opinion is that I get the night off of making dinner with my husband manning the grill. This way I can focus on other things that need to get done around my house. Although I have never been crazy about eating meat, a juicy burger is one I'll tolerate. A burger can get pretty boring though when served in that same classic way- with tomatos, pickles, ketchup and lettuce etc. 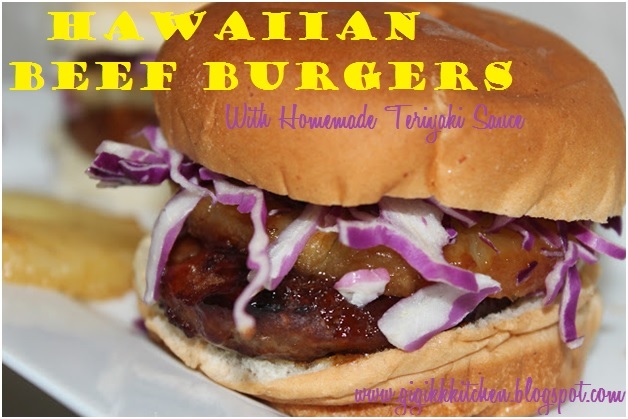 If you are looking for a new way to jazz up a plain burger like I was then you are going to love this Hawaiian inspired choice with a slice of pineapple, red cabbage and homemade teriyaki sauce. Considering that Summer is getting closer to it's end and it will soon be time to say goodbye to our outside grill we are trying to squeeze in as many uses as possible. Don't have access to a grill? Don't worry, these can also be cooked up in the broiler under your oven! 1. Combine the ground beef, spices, egg and breadcrumbs. Form round patties with the mixture and lay them out in a single layer on a parchment paper lined roasting pan. 2. Prepare the teriyaki sauce by combining all of the ingredients in a medium sauce pan and heating over the fire on the stove top for 3-4 minutes or until it comes to a rolling boil. 3. Brush the teriyaki sauce onto each beef patty and on the pineapple rings which then all go straight onto the grill to cook for 8-10 minutes on each side (or in the broiler for 5 minutes on each side). 4. Once the burgers are ready to your liking remove them from the grill. Lay the pattys out on the bottom half of the burger buns. Spoon some of the teriyaki sauce over each patty. Then top them each with a pineapple ring and some red cabbage. Seal it all with the top side of the bun and serve.